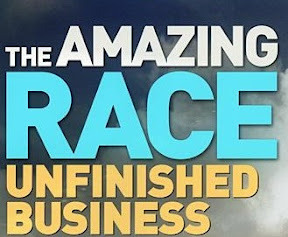 The Amazing Race Unfinished Business Season Finale! Let's face it: no one wants a blow by blow of the last 2 hours. You just want to know, "Who won the Amazing Race?" Now, that said, the Brazilian waxing was the best task ever. Unless you're the hairy Zev and Justin. And then it's ridiculously hysterical and painful at the same time. Zev and Justin's elimination at the end of the first hour was telegraphed earlier in the show when they were the only team not interviews in one of those cutaway segments on the beach. That rather eliminated the drama of the first hour. In the second hour, the teams were in Miami. Gary and Mallory were hit with the curse of the bad cab driver that left them behind other teams. They never really caught up.